While waiting for the inevitable gloom to clear I decided to embark on a new hobby that wasn't weather effected...……………….. whip making. More precisely Bullwhips (like Indiana Jones uses), there are several styles used for different purposes. 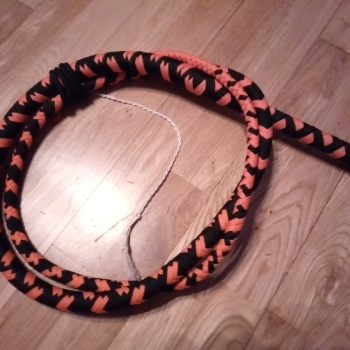 Whip making is a combination of craft, precision and patience to make one, there are lots of considerations in the construction to achieve the characteristics needed to make a whip easy to crack. Then it's a skill to crack it in many different ways and combinations. I was initially impressed by this guy, https://www.youtube.com/watch?v=zTIIZYE7XwE&t=171s he makes it look so easy, believe me it's not, you need to wear a hat and glasses when learning or you will cut yourself easily or take an eye out. Here's my third effort after my initial 2 tries that failed in one way or another. Last edited by Brutie on Thu Jan 10, 2019 9:07 pm, edited 1 time in total.